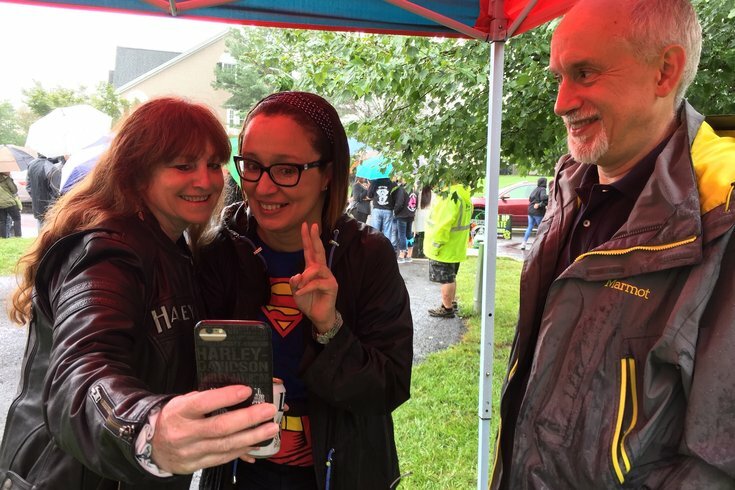 Howard Margolis appears amused as his wife Pam, center, is asked to take yet-another photo at the #LoveWins block party in Schwenksville, Montgomery County. The event was a show of support for a couple who claims their neighbor has harassed them for at least six years now. You’re not really supposed to ride your motorcycle in the kind of rain that drenched the region this weekend. But you’re definitely not supposed to make your neighbors’ lives a living hell, either. Because the latter scenario has played itself out in one Montgomery County development in recent years, a group of area bikers found it necessary to do the former. C.J. 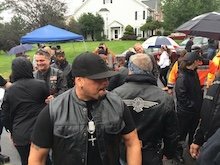 Santangelo and his A Team motorcycle group took to the streets on dreary, stormy Sunday in a loud, staunch show of support for Pam and Howard Margolis and family on Martingale Drive in Schwenksville, Montgomery County. The reason why they were there meshed perfectly with the A Team’s billing as “passionate people making a difference” and standing up for people being bullied, and organizing bike runs and other events to help those in need in and around that part of Montgomery County. The heavy rains didn’t stop dozens upon dozens of neighbors, friends and supporters – including a pair of candidates for state representative in November’s race – from gathering at the Margolis house after noon. There was food (both tomato pie and sandwiches in the garage, and burgers and hot dogs from a charcoal grill under a tent in the street), drinks (Miller Lite, mini bottles of wine and non-alcoholic fare) and umbrellas galore. The point they came to make was crystal clear: Nobody in this bucolic Fox Heath development – or anywhere, for that matter – should face the type of harassment detailed by PhillyVoice last month by a 38-year-old neighbor who’s reportedly thrown racist, homophobic and anti-Semitic slurs and actions their way for the past six years. The crowd featured neighbors (and A Team members) like Suzanne Vernacchio-Wehrli, who said the neighborhood has long been great but for “one bad apple.” She was referring to Matthew Rutkowski, who is currently facing charges that he directed a racial slur at Pam Margolis as she and her husband walked their dog, Bailey. Ric O’Neill walked over from a few blocks away. He and his wife were among the very first residents of Fox Heath. Also on hand were Tom Quigley and Joe Ciresi who, on this day, said they weren’t there as Republican and Democratic candidates for the 146th District statehouse seat, but concerned residents pushing back against a horrible situation. 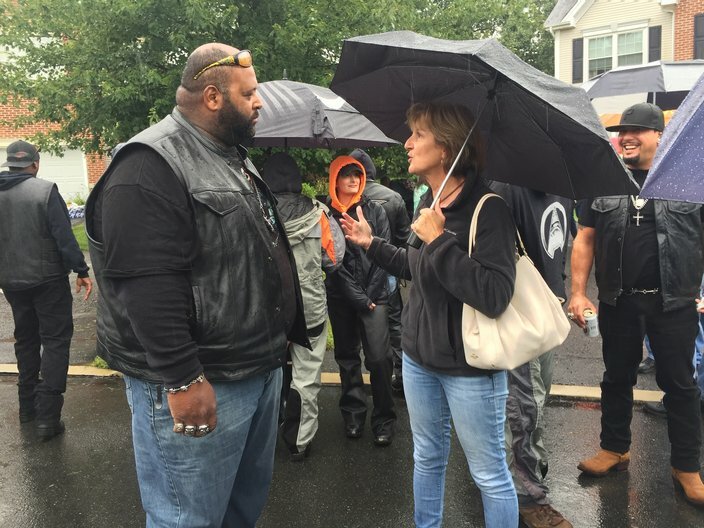 Preston Howard of the A Team motorcycle club speaks with a Schwenksville resident at a block party organized to push back against a neighborhood bully on Sunday, September 9, 2018. Preston Howard, an A Team member, told the crowd what the scene meant to him. “With all hell breaking loose out there in the country, as a black man, seeing something like this restores my faith,” he said. Sure, Rutkowski wasn’t home across the street to see and hear the show of support. He’d pulled away in his white pickup truck at 12:35 p.m., just after four state police vehicles cruised up the block slowly to keep an eye on things. Still, Santangelo stood atop the back of a pickup truck driven here by the grill master Scott Seitz, a former enlisted U.S. Marine and current vice president of the Leathernecks Motorcycle Club who wanted to lend his support to the cause. Dozens of bikers rode through rain to the Fox Heath development in Schwenksville. The A Team head thanked his members for braving the weather to make the point. They were people like Warren Birch, an African-American and A Team captain; board members John Wollman and Mike Yasich; and captains Billy Ebinger Jr., Jordan Herr and Jim Caporaletti. “As small as this may seem, this is a big step in the right direction,” said Santangelo, who was joined by his wife, Michele. Looking back at the block party on Monday morning, Pam rued the thought that "so many people still don't understand that this kind of racism still exists ... it shows that they're completely unaware of their white privilege." She acknowledged the remarkable nature of what had occurred, though. "I think it's amazing that so many people want to stomp out hatred," she said.